To get one common question out of the way, there's no such thing as "shower tile." Many types of ceramic, porcelain, stone, and glass tile are perfectly suitable for a shower environment. There are some important performance factors to consider, but for the most part you can decide on a tile material first, then narrow it down to the size, shape, color, and layout you like best. To simplify matters, choosing good tile for showers starts with focusing on the specific areas where you'll be laying tile. sized appropriately for the space and the slope of the shower pan. Many porcelain and some stone tiles are popular options, while most glazed ceramic tile is unsuitable, because it's too slick (unless the tiles are very small). No tile installation is truly waterproof, and it's not necessary to have tile classified as "impervious," unless the shower is outdoors and subject to freezing temperatures, but the least impervious tiles (classified as "non-vitreous" or "low density") generally aren't suitable for shower floors. Shower floor tile size affects both design flexibility and slip-resistance. Shower floors typically slope about 1/4 inch per foot toward the drain and often have multiple planes to direct all the water to a single point. This makes laying tile in a standard shower pan with anything larger than 6 x 6-inch tiles difficult; 4 x 4-inch or smaller is recommended because it conforms better to slopes and other surface variations. Smaller tiles also involve more grout lines than larger units, and because grout is pretty much like sandpaper, this translates to greater slip-resistance. That said, builders are doing some very cool things with custom showers these days, and the old rules don't always apply. For example, a curbless shower might have large-format tiles covering a floor with a single sloping plane leading to a linear, trench-style drain. The large tiles and one-way slope create a nice surface for movement -- on foot or on wheels -- and the tiles can continue right into the main bathroom area. The most important consideration here is slip-resistance. Slip-resistance for tile surfaces is rated by a measure called the coefficient of friction; large tiles in wet areas should have a COF of 0.60 or higher. Good tile for shower walls includes pretty much any type suitable for very wet locations. Glazed ceramic and porcelain tile are most commonly used, from the ubiquitous 4 1/4-inch white squares to large-format tiles of almost any size -- provided your installer is up to it. Glass and stone also make good tile for shower walls. Large, clear glass tiles are tricky to install and can show moisture behind the tiles; small, colored glass is a safer choice. Stone tiles should be easy to clean and resistant to staining from mineral content in water. As for grout joints, the benefit of slip-resistance doesn't apply to walls (unless you're Spider-Man), so the question of size comes down to wall size, layout and shape, as well as maintenance: the gritty surface of grout is harder to clean than the smooth tile faces. Proportion is critical with all wall tile, and this is particularly true with shower enclosures. Big, cheap tiles, such as basic 12-inch ceramic squares you can pick up at any home center, can look really bad in standard showers and scream "DIY job!," especially when the edge tiles have to be cut to an awkward size. Bathroom designers and good tile stores can offer advice on choosing shower wall tile, as can expert tile installers, who know a lot about proportion, installation, and long-term performance. Tip: Running the wall tile to the ceiling is an easy way to add a high-end touch to your shower enclosure. Some showers have tiled ceilings, and often the ceiling gets the same tile as the walls ... but this doesn't have to be the case. Contrasting tile on the ceiling can provide a nice accent feature. 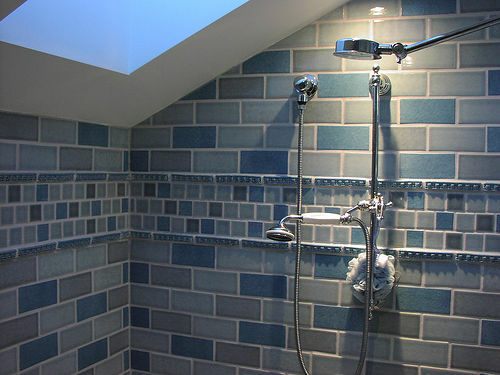 If the shower has a curved ceiling, as some steam showers do, relatively small tiles will work better than larger units. Built-in shower seats, benches, niches, windows, curbs, and other features offer both design challenges and creative opportunities when choosing good tile for showers. Proportion and installation are critical considerations, because the tile must conform well to size constraints and tricky layouts. Another key factor is the exposed edge of any element. Anything with an "outside" corner, including benches, shelves, sills and curbs, needs rounded edges for comfort, safety and a finished look, so make sure the tile you're considering is available in bullnose or other specialty shapes designed to finish exposed edges. Don't want to DIY? Hire a professional contractor for expert shower tile installation. Philip Schmidt writes for Networx.com. Butcher Block Countertops: How Do They Hold Up?